It’s summer and fresh green beans are in their prime. 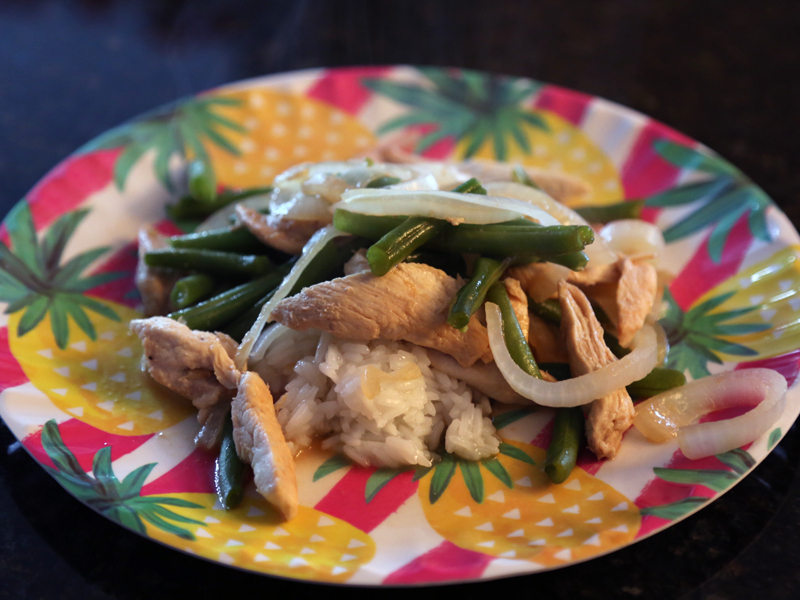 This stir fry combines green beans with white onion and chicken. Yes, you could throw in all sorts of veggies, but there is something about this trio of ingredients I really like. Put the rice on first, and throw the rest of this stir fry in a wok or frying pan with a lid. This healthful dinner takes 20 minutes to cook: the magic amount of time for a weeknight dinner. Heat the oil in a wok or frying pan over medium low heat. Add the garlic to the wok first. After a minute, add the onion and chicken. Then add about half of the water, soy sauce and honey. Cover with a lid and stir occasionally. Add more water (if needed) to keep the ingredients from sticking to the pan. Once the chicken is about halfway cooked add the green beans (this way the beans don’t over cook). Cover again and stir occasionally. Once the chicken is fully cooked serve over the jasmine rice. I like to cut or snap off the "tail" from the ends of the green beans. No Replies to "Green bean stir fry"
This food blog is about sharing simple, healthful and tasty recipes. Dig in!